Director/Screenplay – M. Night Shyamalan, Producers – Sam Mercer & M. Night Shyamalan, Photography – Christopher Doyle, Music – James Newton Howard, Music Supervisor – Susan Jacobs, Visual Effects – Industrial Light and Magic (Supervisor – Edward Hirsh), Special Effects Supervisor – Steve Cremin, Creature Effects Design – Crash McCreery, Creature Effects – Spectral Motion Inc (Supervisor – Mike Elizade), Production Design – Martin Childs. Production Company – Warner Brothers/Legendary Pictures/Blinding Edge Pictures. Cleveland Heep is a building manager at The Cove apartment block in Philadelphia. People report that someone has been in the building’s swimming pool after hours. One night Cleveland sees someone in the pool but falls in as he goes to investigate. He comes around to find that a mysterious woman has carried him back to his apartment. She introduces herself as Story and says that she has come from The Blue World. Cleveland comes to believe that Story may be a Nark, a creature from fairytale. Story says that she has come to The Cove to inspire a writer to create a work that will have a world-changing effect in the future. Cleveland decides to help Story by finding which of the tenants is this writer. As he begins his quest to help Story, Cleveland realises that there are creatures known as scrunts, beasts that can camouflage themselves and are hiding in the grass around the apartment block, that have come to kill Story. He also realises that there are saviours – predestined characters known as The Symbolist, The Guardian, The Guild and The Healer – among the tenants who have a preordained part to play in protecting Story and aiding her return to the Blue World. Indian-born writer-director M. Night Shyamalan came to fame out of nowhere with his third film The Sixth Sense (1999). The Sixth Sense was a runaway success that became the second highest grossing film of 1999. It made M. Night Shyamalan one of the most exciting new creative talents in the industry and he was given a virtual blank slate to do whatever he wanted. Shyamalan’s next three films – Unbreakable (2000), Signs (2002) and The Village (2004) – all earned around the very healthy $100 million plus mark in domestic US box-office rentals. Throughout all of these, Shyamalan crafted a distinctive style. Shyamalan’s films are cerebral ones – they are quiet and intimate films focused on the lives of ordinary, sometimes melancholic heroes who are nursing the wounds of past personal tragedies. In the course of Shyamalan’s films, his protagonists make a conceptual breakthrough in understanding, usually discovering something about the nature of faith and their true purpose in the world. One of the more contentious aspects of Shyamalan’s films is the big twist revelations he keeps building into them. The surprise that came at the end of The Sixth Sense was dazzling – one of the classic twist endings that made the film into the hit that it was. Alas, Shyamalan’s next handful of films kept making it seem that he was a one-trick pony who was determined to spend the rest of his career trying to recapture that one good idea that audiences had connected with. This was not helped by the Disney marketing department that made Shyamalan’s films into big conceptual mysteries that started in the trailer and advertising campaigns, hinting at cosmic mysteries and dazzling mysteries that, when unveiled, only turned out to be damp squibs that verged on the risible – Bruce Willis discovering he was a comic-book superhero in Unbreakable, Mel Gibson discovering a loopy predestined faith in Signs, and especially the twist ending of The Village, which ended up being laughed off the screen by most audiences. Lady in the Water was the point that Shyamalan parted ways with Disney after a much publicised dispute. According to Michael Bamberger’s book The Man Who Heard Voices, or How M. Night Shyamalan Risked His Career on a Fairy Tale (2006) – a work that seems to regard the ground that Shyamalan walks on as sanctified – Shyamalan was not happy after Disney president of development Nina Jacobsen took her son to a party instead of staying home to receive the script for Lady in the Water when Shyamalan had had it personally couriered to her (and was then critical of the script after reading it). This caused Shyamalan to depart in a huff, decrying the lack of creativity to be found at Disney any more. He set up production at Warner Brothers who bankrolled Lady in the Water without complaint. Alas for Shyamalan, especially with the lack of a Disney-styled marketing campaign that built up the mystery and suggestion of conceptual reversal common to all his other films, Lady in the Water received a universal trashing from most critics and earned a well-below-expected $42 million at the box-office. Lady in the Water also featured highly at that year’s Golden Raspberry Awards with Shyamalan winning Both Worst Director and Worst Supporting Actor and being nominated for Worst Film. Not expecting much after reading the vehement US reviews, I sat down to watch Lady in the Water and ended up pleasantly surprised. Indeed, I ended up liking Lady in the Water more than some of M. Night Shyamalan’s other works. Shyamalan based the film on a fairytale that he created for his two daughters – the dedication at the end of the film goes “To my daughters/I’ll tell you the story one more time/But then go to bed.” Many of Shyamalan’s regular themes are present and play throughout. There is the hero grieving the emotional wounds of the past – a la Bruce Willis in The Sixth Sense, Mel Gibson mourning for his wife in Signs – and as with all of Shyamalan’s heroes, their wounds are healed by having their eyes opened to believe in something fantastical. As in Signs and The Village, there are monsters/creatures but these are ambiguous and little seen or with the ability to blend in and seem like part of the environment. There is the especial Shyamalan theme of characters discovering their true place in the world – Bruce Willis discovering he is dead in The Sixth Sense or that he is a superhero in Unbreakable, Mel Gibson and family being able to weave elements of the past together into a preordained puzzle that gives the secret of how to defeat the aliens in Signs. Indeed, the overriding theme of Lady in the Water is that everybody needs to discover the role that they are required to play in a larger predestined puzzle in life. There is the sense, something we also saw in Unbreakable, that fictional stories like comic books and fairytales have a deeper underlying truth and that people need to discover what archetypes it is their purpose to play out. As always, Shyamalan directs with a quiet intimacy, evoking his character interactions in whispered two-shots rather than big clichéd dramatics. Paul Giamatti tends to overdo the stuttering hangdog thing, but Bryce Dallas Howard, Shyamalan’s big find in The Village, presents a pale and mysterious otherworldly beauty. There are certainly times that Lady in the Water teeters on the edge of the completely loopy. There is the moment where one of the characters expostulates aloud: “He’s hearing the voice of a God in a crossword puzzle! ?” and the very mentioning of such tends to emphasize the absurdity that had been bubbling beneath the scene (and sends the audience off into unintentional titters). Later when we get to another character searching for clues as to what is going on in a shelf of cereal boxes, Shyamalan seems to be defying the audience to start laughing. One suspects that underneath it all Shyamalan is a loopy mystic who believes in signs, portents and predestination himself. Shyamalan also makes cameos in all of his films. Here he plays his biggest part to date as a writer who has a great destiny ahead of him to write a book that will inspire a youthful leader-to-be to go onto change the world. Casting himself in such a role was an unwise move upon Shyamalan’s part, as it cannot help but smack of big-headedness and a love of one’s own self-importance. One of the more amusing and at times almost precious parts about Lady in the Water is the inclusion of Bob Balaban as a film critic. There is an amusing scene where Balaban faces the scrunts and has a monologue aloud where he wonders if he is the obnoxious character in a horror film whose purpose it is to end up a victim or whether he is in a family film and will end up surviving. It is a scene that is oddly out of place, something that belongs more in a Kevin Williamson script like Scream (1996). 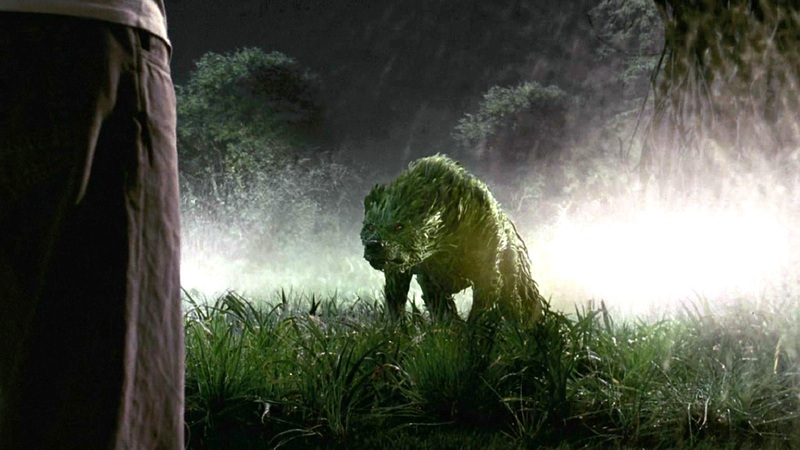 Balaban’s character also perhaps shows Shyamalan’s dislike of critics – the critic purports to be able to interpret the cryptic symbols that Story gives but is then proven wrong and is later the only person in the film to receive a nasty death. While most of the world hated Lady in the Water for its loopiness, I rather enjoyed it. One liked the film for the puzzle box that it holds – the plot is like seeing a jigsaw of a strangely haunted scene falling into place. For all its moments of pretension, Shyamalan winds everything into an absorbing puzzle that frequently teeters on the loopy but eventually finds its feet to tell an interesting and original story. In the era of processed movies where the majority of releases consist of endless sequels and remakes, you have to admire M. Night Shyamalan for going out on a limb and trying to create an original cinematic work and trying to say something about the nature of myth in the world. The almost universal derision granted Shyamalan with Lady in the Water considerably weakened his name at the box-office. He subsequently went onto make the enigmatic catastrophe film The Happening (2008), the fantasy adventure The Last Airbender (2010), the planetary adventure After Earth (2013), the Found Footage horror comedy The Visit (2015) and the split personality film Split (2017) and its sequel Glass (2019), often to very mixed audience and critical reception. Shyamalan also produced and came up with the story for The Night Chronicles 1: Devil (2010) and produced the tv series Wayward Pines (2015-8). (Nominee for Best Actress (Bryce Dallas Howard) at this site’s Best of 2006 Awards).